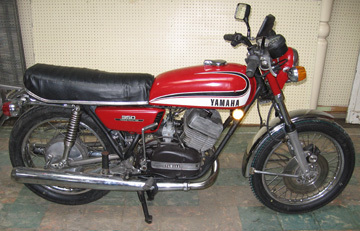 For Sale - 1973 Yamaha RD350, near completion, 90-95% restored. If ever you hear of a prospect buyer, I am asking 1200.00$CDN (950.00$US). Pics available. Anyone interested (or know someone who might be)? Contact Roland with questions and pic requests. Help find this ride a new home! Finally got the right set of rearsets from Omar's. These were a gift for my 30th from my friends, just about all of whom ride. At first I had gotten the wrong set, but the right set (shown above loosely mocked up) has arrived. It's amazing how light these things are. All major components are made from cast aluminum, and have lightening holes wherever possible. They look great! I haven't mounted them to the bike yet, as doing so requires that I bend the kickstart lever. So until I can do that, the stock foot controls will have to stay. 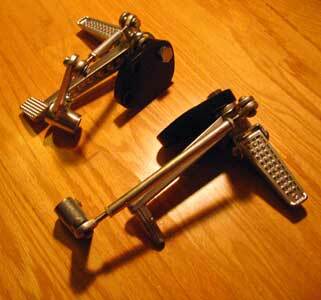 I picked up a used kickstart lever from Ebay so I can keep one in reserve for when/if it needs to be switched back. Or if I screw up bending it! I tracked down and purchased a NOS right-hand mirror from Roland via the Yahoo! R5 Group. Finally I'll be able to see behind me completely! It just arrived, but I need a bracket to mount it, so I'll have to do more digging to scrounge one of those up. So after so much speculation as to what could possibly be wrong with my bike (condenser? points? coils? ), it turns out that the battery was shot and wouldn't hold a charge. Mike over at Hiway Cycle was nice enough to fill up my new battery with acid and charge it up... and first kick she roared back to life! Apparently, the ignition on the R5 relies completely on the battery for spark. So, a bad battery = poor spark. A good, fully charged battery should be able to run the bike for a few hours or so, with no lights on. Anyways, looking forward to a nice long riding season.